When you spend more than a few days in a foreign country, one of the first things you eventually do is go to a local supermarket—this is not surprising. It's also not surprising to imagine that much of what you'll find there, being that the grocery store in question is foreign, will be strange by your existing standards. One category of items you might not expect to focus on, but should, is potato chips. Specifically, the different flavors of Lay's Potato Chips that are available wherever you happen to be. From cool, refreshing flavors available in China, to spicy flavors that mimic the fresh food prepared on the Indian Subcontinent, Lay's are anything but ordinary in many parts of the world. Seafood is a major staple of diets in Southeast Asian countries such as Thailand and Vietnam, so it should come as no surprise that flavors from the sea dominate Lay's varieties in this region. Would you prefer to eat "Hot Chili Squid," "Salmon Teriyaki," or "Crab Spice Seasoning"? Unfortunately, "Pad Thai With Shrimp" and "Green Curry With Chicken" are not yet available, but keep your fingers crossed. Seafood not your jam? In Thailand, you can enjoy "Sweet Basil" Lay's, whose refreshing flavor focuses solely on the herb that's so important in Thai cooking. Speaking of "refreshing" there's only one thing stranger than the existence of "Cool and Refreshing" Lay's flavors such as "Blueberry," "Lemon Tea" and "Kiwi" in China. The fact that they are delicious— the sweetness of these flavors perfectly counteracts the chips' natural saltiness. The flavors (and no doubt, the ingredients Lay's uses to create them) are faker than anything, but then again, when in history has a little fakeness ever stopped China? 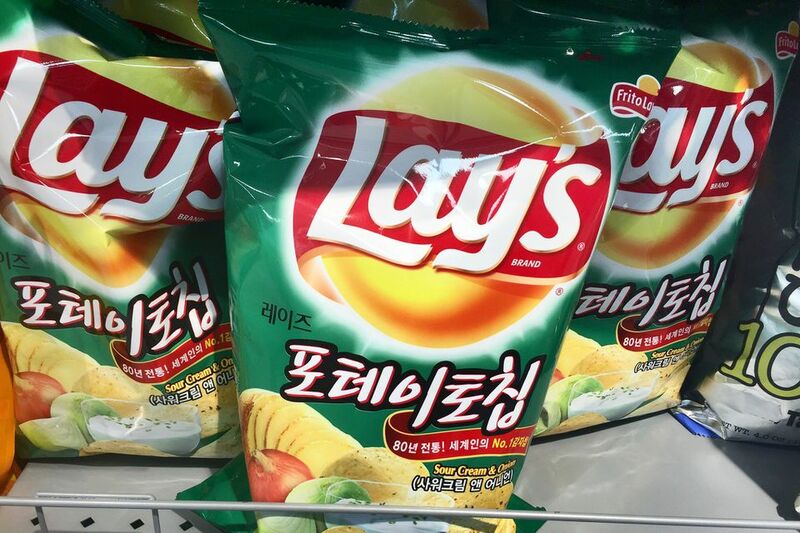 It will be interesting to see how Lay's flavors evolve along with China's ever-changing public mood. India's known for being bold, brash, and sometimes overwhelming and the flavors of Lay's potato chips here are no exception. Although they often simply mirror flavors of Indian food, such as "Magic Masala" or "Mint Mischief," they are unique compared to most of the flavors you'll find stateside, a truth you can extrapolate to Indian food in general. On the other hand, you might not want to eat these with your curry, lest you offend the chef who cooked it. A happy medium might be to buy a few bags and keep them in your hotel room, in case you need a late-night snack when all the nearby restaurants have closed! Now, whether eating potato chips is à la mode is another question entirely—leave it up to les français to answer that one. It also remains to be seen ubiquitous French flavors such as "Escargot" and "Os à Moelle" (bone marrow) will ever make it onto the surface of Lay's. Or, worse, can you imagine horse- or frog-flavored Lay's? Non, merci! If you've ever been to South Africa, you've certainly encountered biltong, a beef jerky that's perhaps the country's most popular snack. Like beef jerkies in the US, biltong comes in a variety of quantities and sizes, and the best ones can often be expensive, to say nothing of how difficult they can be to eat. A good way to get that delicious Biltong flavor, without the tough texture (and, potentially, a tough-to-swallow price) is to purchase Biltong-flavored Lay's. Did you know that Russia is one of the world's top producers of wild caviar? Caviar from the various sturgeon species that swim Russian waters of the Black and Caspian Seas is among the most prized—and expensive—in the world. If you want to enjoy the flavor of caviar without shelling out hundreds of thousands of rubles, pick up a bag of "Red Caviar" (Russian: Krasnaya Ikra) Lay's the next time you're in Moscow or St. Petersburg. Another factoid many people don't realize is that Argentina, in spite of having Spanish as its national languages, is primarily composed of immigrants whose origin is Italian. For this region, it should come as no surprise that Lay's markets local flavors in Argentina (and in neighboring Uruguay, for what it's worth), under the "Lay's Mediterraneas" imprint. Various Mediterranean-inflected flavors of Lay's are for sale in Argentina, including "Smoked Manchego Cheese," "Beef Carpaccio with Parmesan," "Olive Oil and Tomato," and simple favorites like "Lasagna" and the even simpler "Ham." No words as to whether Lay's will ever create chips that bear of the flavor of Argentina's world-famous beef. In spite of being home to a bevy of incredible attractions (like Transylvania—the real one), Romania is a country many travelers forget when planning their European vacations. Likewise, you might not have thought to consider Romania when pondering countries whose Lay's flavors are on the more imaginative side. Pickles aren't an exceedingly important part of Romanian cuisine, so it's not clear why this flavor has taken off in the country. At any rate, taking a selfie with a bag of these in front of Bucharest's triumphal arch is sure to get you some social media likes. Lay's in the U.S. have historically been pretty ordinary, but over the past several years, annual voting competitions for bizarre flavors have put a decisive end to that, bringing about flavors like "Sriracha" and "Chicken and Waffles." In a way, these are even weirder than some of the other international flavors we've just seen, which you could argue is much of the appeal of the competition in the first place. More recently, Lay's introduced a spate of international flavors in the U.S., inspired by the 2016 Summer Olympics. These include "Chinese Szechuan Chicken," "Brazilian Picanha," "Greek Tzatziki," and "Kettle-Cooked Indian Tikka Masala." Canada, they say, is just a nicer version of the United States. Canadian cities are cleaner and safer than ours, Canadian people friendlier and less aggressive than Americans. These are subjective statements, of course, but you'll hope they're true (and apply in all situations) when you sink your teeth into Canada's ketchup-flavored Lay's. Because really, if any country in the world can make ketchup chips palatable, it's Canada. Turkey is home to some of the most delicious food in the world, from the döner kebab, a perennial drunk-food classic (on the streets of most cities in Europe, anyway) to baklava, a dessert so tasty that many countries around the Middle East lay claim to it. Turkey's most interesting Lay's flavor is slightly less satisfying than any of its most famous dishes, even if it centers around an ingredient that's central to all of them: Yogurt, accented with unspecified "seasonal herbs." Can You Believe They Have a Desert in This Country?